Birthday: The kitten has to get warmth as soon as possible after he was born. I use a heating pad and a warm towel. It's very important that the kitten receive the mother's first milk, colostrum, which contains antibodies and helps immune system to fight infections. Second day: The kitten might lose 10gr from change and adjustment for new environment. Third day: The kitten gains 10gr of weight. He either sleeps or eats. The umbilical cord drops off. Second week: The kitten's eyes start to open. The kitten should be away from bright light. If his weight have not doubled, he needs more food. I tube-feed my kittens, if it's necessary. Please feel free to ask for instructions for tube-feeding. I recommend KMR commercial milk or solution of whole milk and quail egg yolk. A syringe without needle could be used for feeding as well. The kitten needs 20ml of milk total for 100gr of weight. Third week: The ear canals begin to open. The kitten start to explore. Fourth week: The kitten can stand up. The kitten starts to use litter box. The natural litter like World Best Litter has to be used, because the kitten might eat some of the litter. The kitten wants to socialize with people and other cats. Fifth week: Baby teeth start to appear. The kitten tries to eat semi-solid food. I offer my kittens can food, unsalted cottage cheese, raw eggs, Royal Canine baby food. 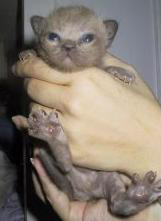 Sixth weeks: The color of the iris of the Burmese kitten eyes becomes gold. I de-worm my kittens with Drontal. Seventh week: Kitten could be weaned. He plays and runs with his siblings. Eighth week: I vaccinate my kittens for the first time when they are 8 weeks old. Twelfth week: Second vaccination should be done. Fourteenth week: Adult teeth will start to appear. Fifth-Seven month: Pet kitten has to be de-sexed. The kitten's coat becomes darker and shinier. Eighth month: The kitten is not a kitten any more. He is an adult cat.